I was paired with young mom (compared to me that is) Betty Anne for the Adoption Blogging Project. Betty Anne is in an open adoption with her daughter, Chloe, age nine, and her adoptive family. Below you will find my questions to her (in bold) and her or her husbands responses (in italics). Thank you Betty Anne! We were in the first group to be live November 12. See others in same or visit Betty Ann’s blog to read more about her. I see you had other children post placement of your first child into an open adoption. Have you thought about how to explain to them why their sister does not live with you? I think they are too young at this point to have asked (or not?) but how do you plan to explain? James is 2 and Reese just turned 1. Thankfully, I haven’t had to field any questions just yet from them about Chloe not living with us. But I’m sure the questions will come at some point. My explanation to them will be the same as what I tell Chloe, whenever she asks the same thing. To Chloe: I chose adoption because I wanted more for your life than I could offer you at the time. I wanted you to have a mom AND a dad. I wanted you to be in a stable home environment. I wanted your physical and emotional needs to be met in a way I was not able to provide at the time you were entering the world. 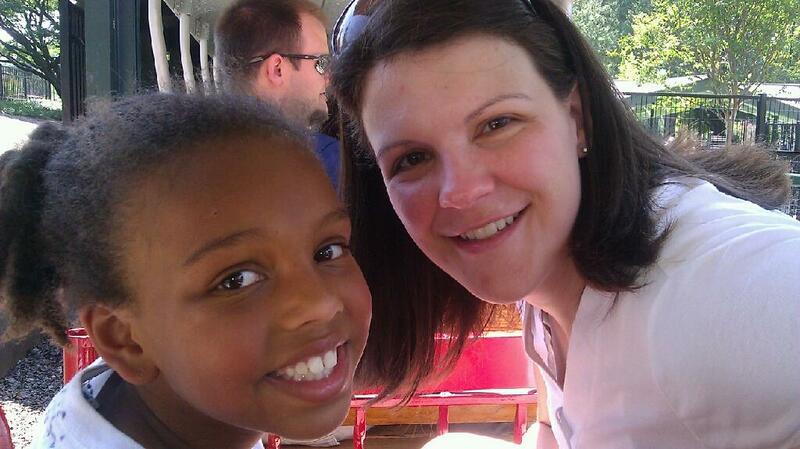 The way I saw it, I had three yucky options: single parenting, abortion, or adoption. I immediately ruled out abortion because I didn’t think I could live at peace with that decision for the rest of my life. Single parenting I eventually ruled out after talking with several other single parents. I chose adoption because, for me, it was the best of the three not-so-ideal options. You were born in 2004. In 2008, I got married, graduated from nursing school, and started working as a nurse. My life circumstances were vastly different than in 2004. I attribute that to you. After you were born, I wanted to become a better person. I wanted to make something of myself that you could be proud of. Funny, it’s usually children trying to make their parents proud. I wanted to make my child proud of me. After placing you for adoption, I found the motivation and determination I needed to start school to pursue a nursing career. I don’t know if I would have done that if you had not come into my life. You also softened my heart. I had never been in love before I met you. The instantaneous amazement and connection and deep, deep level of emotion I felt for you is what I think enabled me to be open to getting married a few years later. My heart was too hardened before that. I also didn’t know I wanted kids until AFTER you were born. I didn’t get it. I didn’t know the wonder and awesomeness that kids are until you showed me. So it’s because of you, Chloe, that I chose to have more kids. After I was married, in a stable relationship, with a stable home environment, that’s when I chose to have more children. Hopefully that sheds some light on why you don’t live with us, Chloe, and James and Reese do. You made me into the mom I am today. I am so eternally grateful to you. Your daughter is nine and you now have other children (her two half siblings presumably). Does she have a relationship with them? Has she matured to a point where she wonders why you gave her to adoption but kept her siblings? If not, what are you plans for addressing that question should it come? Chloe has met James on a couple of occasions. She has seen Reese once, but never been formally introduced. They do not have what I would call a “relationship” yet, but I hope they will in the future. It will be entirely up to them, though, to make that decision. Your daughter appears biracial. Was that a consideration in placing for adoption? You are correct. Chloe is biracial. I am white. Her birthfather is black. It is a fear of mine that she will wrongly believe one day that the color of her skin had anything to do with why I placed her for adoption. It absolutely did not. As I answered previously, my reasons for choosing adoption were completely unrelated to race or ethnicity. Having said that, the fact that Chloe is biracial played a huge part in the family I chose to raise her. It was one of the most important things to me in a family. I wanted either a biracial couple, or one of the couple to be biracial. If that wasn’t possible, I wanted the couple to have already adopted a child of another race. I wanted race and racial issues to already be on their hearts and minds. This is one of many reasons why Chloe’s parents are so great, in my opinion. Melissa (Chloe’s mom) is Cuban-American. Alvin (Chloe’s dad) is Puerto Rican-American. AND they had already adopted a son that was biracial like Chloe. That was everything I was looking for and then some. What advice would you give to an expectant mother considering open adoption? If you are looking into adoption, you are obviously in a situation that you consider less than ideal. You are your own best advocate. Do your homework. Read about adoption. Talk to single parents and adoptive parents and birthparents. You need to know that prior to the child being born and placed for adoption, you have all the power and control in the world. After you place the child for adoption, you have next to no power at all. It’s important that you understand that. Whoever has the baby has the power. Open adoption can be a best-worst-case-scenario, like it was for me in my crisis pregnancy, or it can be a living nightmare like it has been for so many other birthmothers. Mainly, I try to support BA as best I can by being a sounding board. I don’t view her adoption process as a negative part of her life because it made her the way she is today ( which is a very caring and loving person and mother). The only part of her adoption story that makes me feel uncomfortable is that I feel it is very personal and it isn’t MY story. So, I don’t feel right about sharing it with other people even though I know BA wouldn’t mind etc. You wouldn’t think it would come up that much but it does, particularly when you are having more kids. Nine years post placement, what would you have done differently, if you could go back? (Silly question, I realize but it is always illuminating to see what mothers would change if they could). Such a great question. I have racked my brain trying to think of what I would have done differently, and I can’t really come up with anything. Besides making life choices that led me to becoming unexpectedly pregnant, the rest of the process went as well as it possibly could have. My parents were incredibly supportive of me, whatever decision I made. I didn’t have anyone pressuring me one way or another in my decision making process. I felt in control of things. I picked a family I absolutely love. I did pre-placement counseling with an adoption agency that I felt allowed me the space to make the right decision for me and my child. I did post-placement counseling with the same agency as well as a pregnancy support center. Melissa and Alvin have welcomed me in their lives with open arms. Chloe is an INCREDIBLE person. Honestly, I couldn’t ask for more. I would caution any expectant mother to be very, very careful with “open adoption”. I am a natural mother who thought she was entering into an open adoption with the adoptive parents I chose for my child. They ended up cutting contact after just a few years and up and moving, leaving me not knowing if my child was even dead or alive for many years, until I found him. Before the relinguishment, they told me anything I wanted to hear, even lying to me about promised correspondence until he was 18. They were “good Christians” who looked great on paper but their smiles and sweet, saccharine promises to my face were bogus. What I didn’t see was the underlying anger the adoptive mother had toward any woman who could conceive when she could not. That made for a very angry, bitter, hateful woman. Unlucky for me, the natural mother who’s child she got her hands on bore the brunt of that anger. “Reunion” was no better. They treated me despicably when I found my child. How dare I. If I had a do over I would have never gone through with it. I don’t care what material possessions they provided, how many trips, vacations or private parochial schools- anyone who is capable of lying to someone when they are at their most vulnerable state to procure her infant has no business raising her child. Shelly – Did you read my interview on Betty Anne blog? I am inclined to agree with you and said so. I don’t believe open adoption is the cure to closed. It is the latest social experiment. Until adoptive parents are held to legally binding agreements, it is nothing more than the latest social experiment in adoption geared towards luring vulnerable mothers and needy adoptive parents. I am pleased to see open adoptees start speaking for themselves. They are the only ones to truly tell us how well (or not) it works. Agree with everything you said, absolutely. As a natural mother who lived this nightmare, I feel inclined to warn vulnerable young women that this is not the win-win everyone who has to gain from separating her from her child attempts to make it out to be. Any agreement that is not legally binding is fraught with uncertainty. I think open adoption agreements should be made by legal contract, with conditions for enforcement/termination clearly specified. Given the current status of open adoptions, however, all one can do is hope this works out for Betty Anne and that the adoptive parents honor this contact for a lifetime. I was brought to tears by the first question and answer. I’m honored to be able to read this. Judy, thanks for reading! Shelly, you are absolutely right that it is not okay for “open” adoption to be used to entice a first mother to choose adoption and then rip that away from her after just a year or two. As Suz has written about many times, this adoption system is certainly a broken one and favors those footing the bill: the adoptive families. This is a great interview post! I found both the questions and answers really thoughtful.